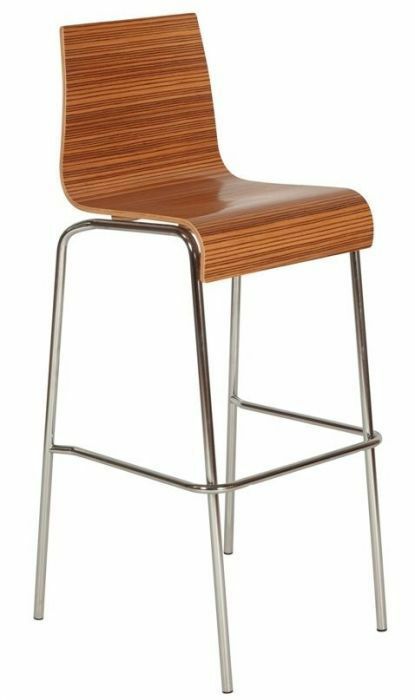 Attractive bar stool with a plywood shell in Zebrano and a stable four leg Chrome frame. Available from stock for a 3-5 day delivery to mainland UK. Would suit a trendy commercial interior. Modern day trendy bar stool, with a unique Zebrano finish. Conveniently this bar stool is released on a 3-5 working day delivery from order. The structure includes a sturdy and stable tubular chrome frame. A must have for modern-look commercial bar or cafe area.